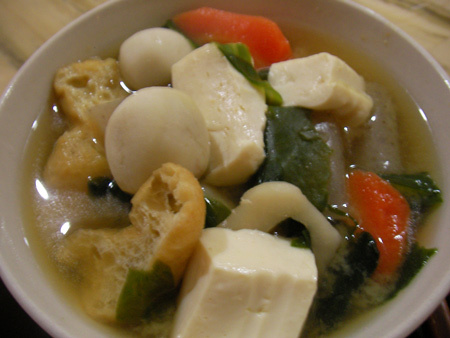 Ozoni, or mochi soup, is a Japanese holiday meal traditionally prepared on New Year’s Day. 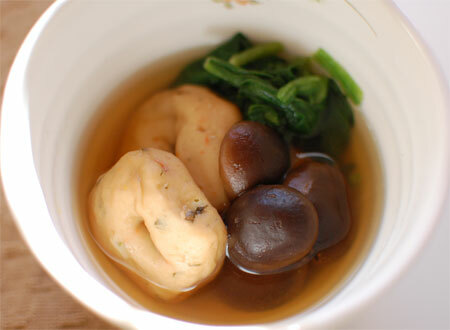 The type of ozoni is different in different area in Japan – some area use round mochi while other use square mochi, some people bake mochi before adding to the soup while other people simply soften the mochi in hot water, and the soup is just seasoned with soy sauce and salt in some area while some people in different area add miso to the soup. In my house, we normally add miso to the soup. 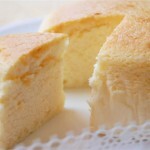 The mochi is sometimes baked before adding to the soup, but not always. I’m not sure adding miso to the ozoni is Shiga thing, but I remember eating ozoni in miso soup at my brother’s karate party when we were kids. The party was at Biwa Lake bank in winter, after kangeiko (mid-winter training). All kids in karate uniform went inside the lake and do some work-out in the freezing water. Watching it made me wonder how they could survive in the water in such a cold day. Karate uniform is not water proof! After a hour of training, we all ate ozoni near the fire. It was so delicious! I used mochi I bought from an Asian grocery shop. This mochi is cut into portions and individually wrapped. You can add any ingredients to the soup – more you add it develops more flavour. This time I only used simple ingredients : burdock roots, carrots and spring onions. I didn’t bother baking mochi, but it will give delicious nutty flavour if you do. Place water into a pot, and bring to the boil. Add dashi stock to dissolve. Add burdock roots and carrot to the pot. Simmer for 3 minutes. Turn off the heat, and add miso paste. Mix well. Add spring onions. Turn on the heat to low, and gently simmer for another few minutes. Add mirin, and then turn off the heat. 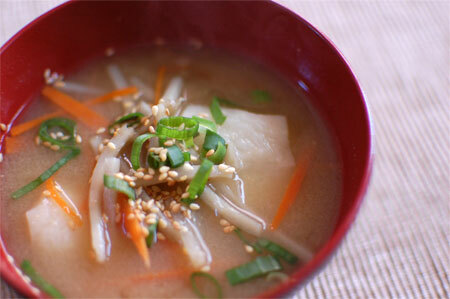 Add mochi to the soup to warm up, or bake in an oven toaster. Place one mochi in a serving bowl, and pour the soup. Sprinkle with sesame seeds. 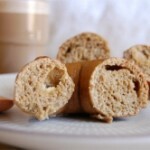 I made a quick soup with this tsumire for my breakfast this morning. 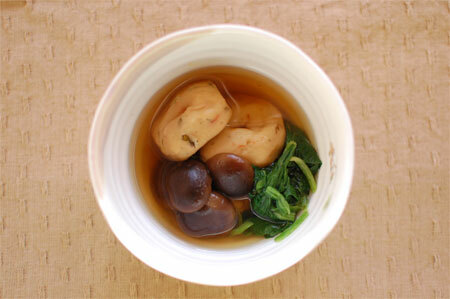 Very simple – simmer the ingredients in dashi stock, and eat with ponzu. Wash and cut spinach into 3cm. Place dashi and shiitake in a sauce pan, and bring to gentle simmer. Add tsumire, and simmer for 2~3 minutes. Add spinach, and enjoy with ponzu. Another winter food in Japan is…. yes, Nabe! 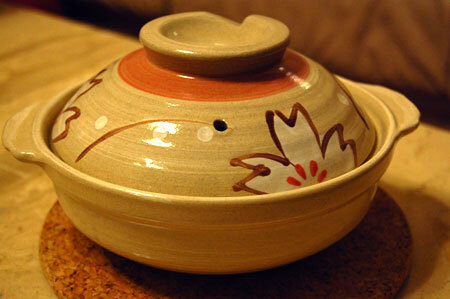 Unfortunately I don’t have clay or cast iron pot here, so I made it with normal pot. 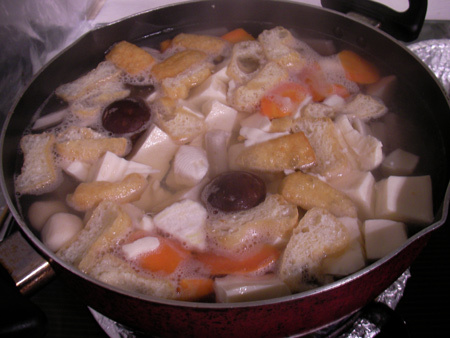 I added as many ingredients as possible….. same as oden, more ingredients you add more flavorsome it becomes. 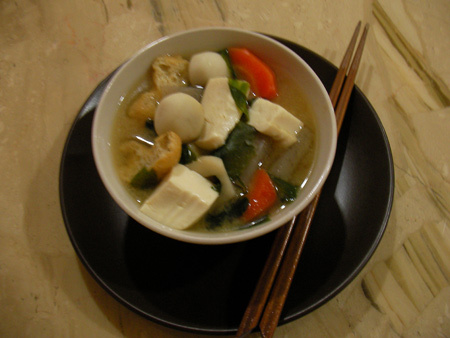 The typical ingredients for nabe in my house are Chinese cabbage, spring onion, tofu, carrot, chicken (or pork or fish) meat balls, chicken meat with bones, mushrooms, and kuzukiri – starch noodle. 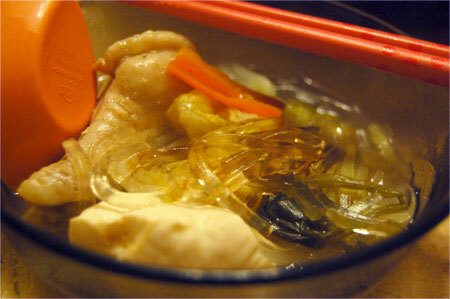 Kuzukiri is one of my favorite food in nabe: it’s chewy. 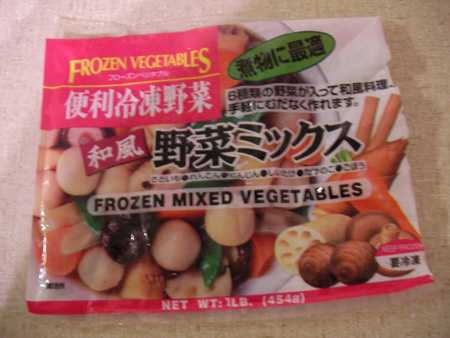 You can add any ingredients you like, such as spinach, fish meat, fishcakes, udon etc etc. It’s fun to gather friends and share a nabe on the table while watching tv. This time, I made nabe with chicken soup. Cut ingredients into desired size. Place the ingredient all together in a pot. If you are using Chinese cabbage, place them on top as if it covers the entire food. Bring to the boil, then simmer. You can do this process on the portable stove on the table. Eat as it cooks. Add ponzu directly into the pot, or use ponzu as a dipping sauce. 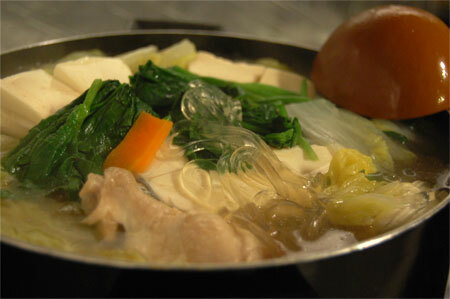 There are many different flavors of nabe, including kimuchi, miso, seafood, soy milk, and curry. After continuous eating-out at Chinese restaurants, a steak house and a smorgasbord restaurant, I really really needed to rest my stomach with some hearty Japanese food. 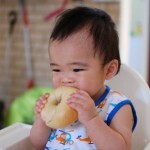 In traditional Japanese cuisine we don’t use much oil, fat and meat. That’s why Japanese food’s known as healthy, good diet among the world. 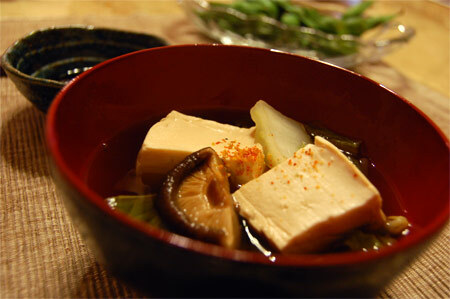 Tonight I cooked a broth with Chinese cabbage, shiitake mushroom and tofu. 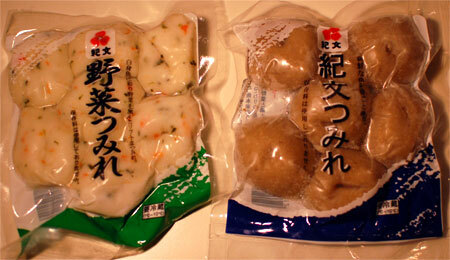 I wanted to add enoki and shimeji mushroom but they are really expensive in Perth… I love mushroom! Bring the water to boil. Add dashi powder and stir. Add sake, soy sauce and salt. Place cut tofu, Chinese cabbage and mushroom to the pan. Simmer for 10~15 minutes. Sprinkle ichimi-togarashi (one spiced chilli powder) if you like. If the soup is really bland, you can add more soy sauce or salt. 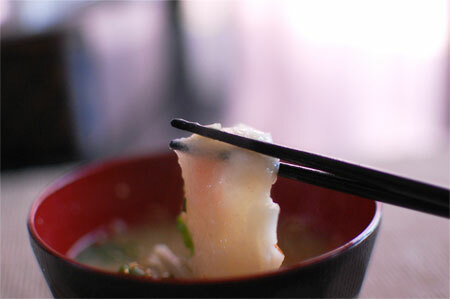 Or, you can use ponzu as dipping sauce. 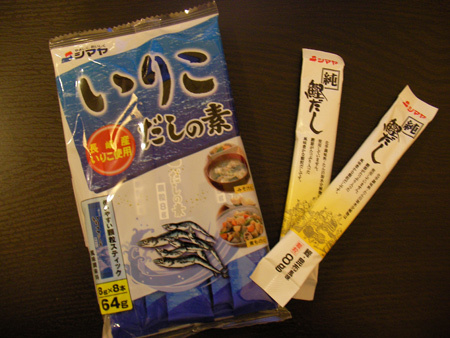 Ponzu is commonly used for Japanese steamboard dish and simmered broth. 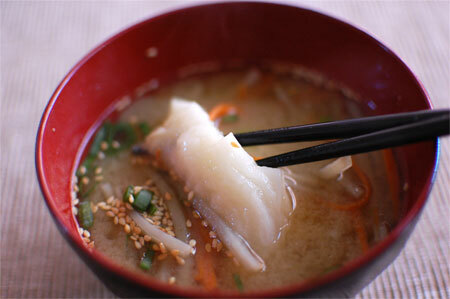 It’s been very cold lately…(><) To warm up, I cooked miso soup! 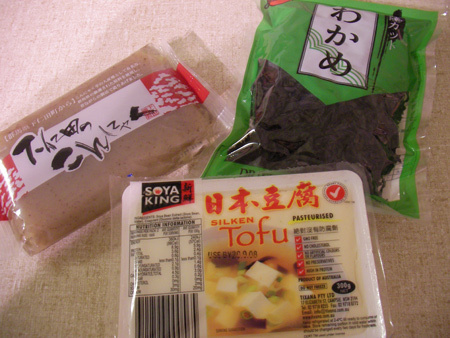 You know, miso soup is not always with just wakame(seaweed) and tofu. 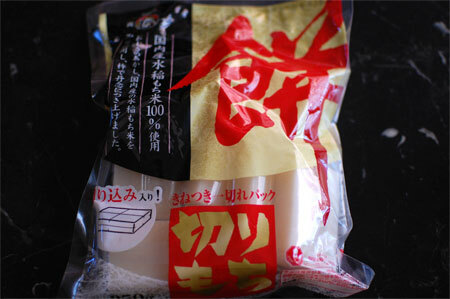 Dissolve this Dashi powder (stock) into water. The amount is about 4g of Dashi : 600ml water. You can put lots of things into miso soup, like root veges, tofu, potatoes, konnyaku, legume, fish, clam etc… In Japan we also put pork meat into miso soup too, the dish is called “buta-jiru”. It’s really really nice and I can eat just this with rice. Turn off the heat, and then dissolve miso paste. Do not boil the soup after putting the miso paste as it will kill the flavor.